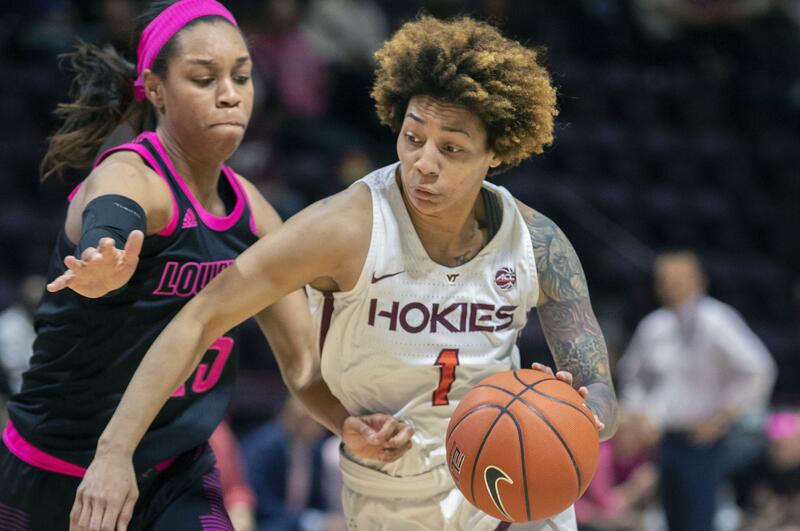 Sun., Feb. 10, 2019, 7:34 p.m.
BLACKSBURG, Va. – Asia Durr scored 34 points and No. 2 Louisville overcame a near-collapse in a 72-63 victory over Virginia Tech on Sunday. STANFORD, Calif. – Sabrina Ionescu had 27 points, nine rebounds and eight assists, and Oregon ran its NCAA-best winning streak to 16 games by running away from Stanford to snap a 29-game losing streak at Maples Pavilion. Ionescu scored 17 of her points in the first half and made 12 of 20 shots as the Ducks (23-1, 12-0 Pac-12) ended Stanford’s 22-game home winning streak. The loss was one of the worst in Hall of Fame coach Tara VanDerveer’s 33 seasons at Stanford. SOUTH BEND, Ind. – Arike Ogunbowale scored 27 points and Jessica Shepard added 26 as Notre Dame got its transition game going again to beat Florida State. Ogunbowale, who had just 13 points on 4-of-15 shooting in Thursday’s loss at No. 25 Miami, moved closer to becoming the school’s leading scorer. She has 2,301 points. Skylar Diggers-Smith is the all-time leader at 2,357. STARKVILLE, Miss. – Teaira McCowan had 24 points and 15 rebounds, Jordan Danberry added 20 points Mississippi State pulled away late to beat Tennessee. BERKELEY, Calif. – Destiny Slocum scored 26 points and Oregon State overcame an 11-point deficit to beat California. MILWAUKEE – Natisha Hiedeman scored 22 points, Allazia Blockton had 19 and Marquette beat Villanova for its 12th consecutive victory. PISCATAWAY, N.J. – Kaila Charles scored 17 points and Maryland extended its lead in the Big Ten by beating Rutgers. The Terrapins (22-2, 11-2 Big Ten), who have won seven straight, own a 1 1/2-game lead in the conference over Rutgers (17-6, 9-3). SYRACUSE, N.Y. – Miranda Drummond made 6 of 9 3-pointers and scored 24 points, and Syracuse beat Boston College. COLUMBUS, Ohio – Megan Gustafson had 19 of her 29 points in the second half as Iowa pulled away to beat Ohio State. SALT LAKE CITY – Kennedy Burke scored 26 points, Michaela Onyenwere added 25 points for the sophomore’s 11th 20-plus game of the season and UCLA beat Utah. PITTSBURGH – Beatrice Mompremier scored 23 points with 13 rebounds and Miami kept Pitt winless in the Atlantic Coast Conference. Published: Feb. 10, 2019, 7:34 p.m.